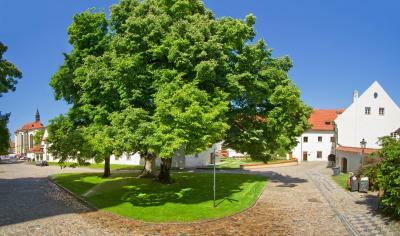 Lock in a great price for Monastery Hotel – rated 9.3 by recent guests! Fantastic staff. They go out of their way to meet your every need. Great breakfast! 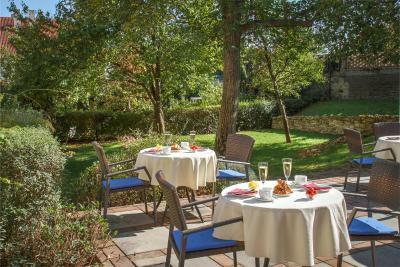 Beautiful little dining garden terrace w a superb view. 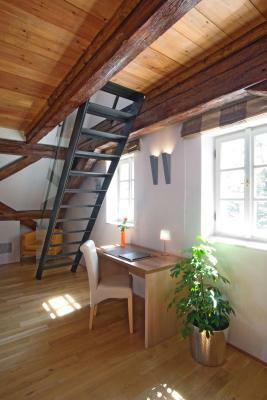 My room had a small window that could only be viewed when standing near the bottom of the loft stairs, but what a view! World class! Quiet location. Oh and get this- when I mentioned I would be leaving at 4 a.m. they packed me a meal bag and brought it to my room the evening before (room has mini-fridge). 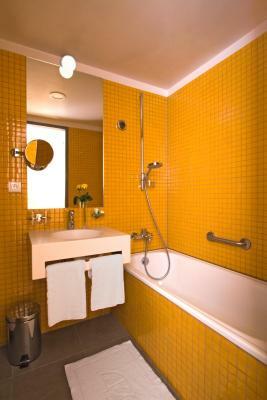 The staff was very friendly and helpful, the room was large, and the bed quite comfortable! Breakfast was outstanding! The view of the city was also gorgeous. Close to a tram stop, as well. 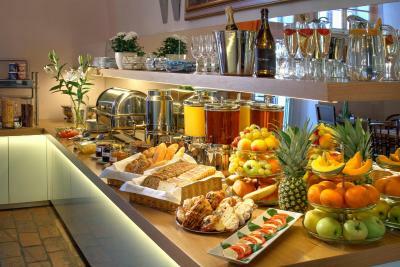 Room was great, best breakfast I've had on this trip. 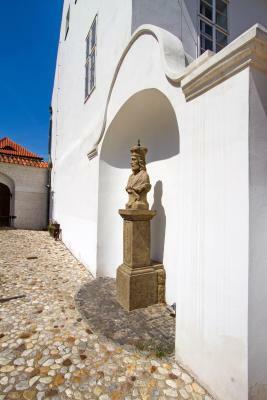 Location was great, surrounded by historic buildings. 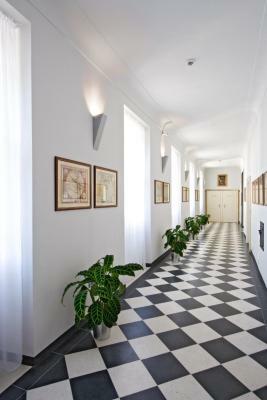 Delightful location in the grounds of a monastery above the city. Very quiet and peaceful. 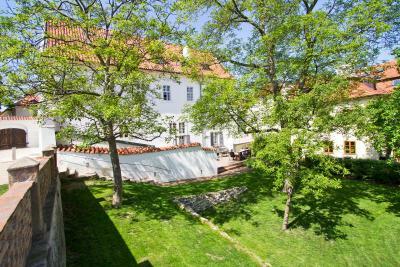 Wonderful location on Strahov Monastery property above the hustle and bustle of town, yet a gorgeous enjoyable walk away from it. Staff super friendly and helpful. Rooms simple yet comfortable, incl. bed. Breakfast delicious. Loved the free coffee, espresso, cappuccino, tea 24 hours a day. 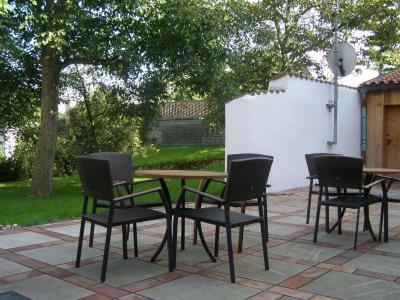 Very quiet area, private courtyard with great views. 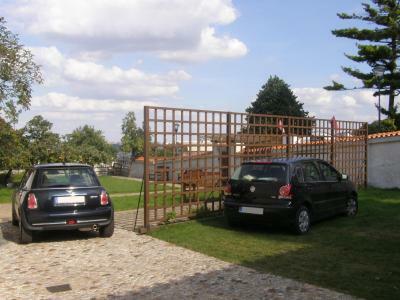 Close to several of the main attractions and very good public transport connections. Great property- a bit off the beaten path which was what I wanted. 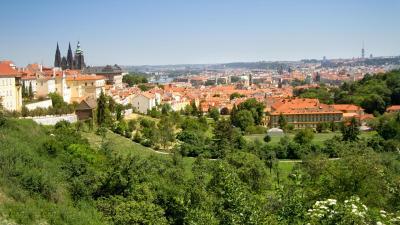 Please know that all the major tourist sites are within walking distance but it is a good walk- and uphill coming back. That said public transport is immediately adjacent to the property and readily available for those who would rather ride than walk. There are a couple of restaurants/breweries on the property making it perfect for a nightcap. If you, like me prefer to stay local rather than the big hotel chains I highly recommend the Monestary. Wonderful stay, great staff, impeccably clean and a million dollar view. 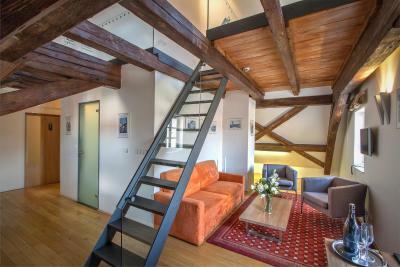 Nice quiet location and the tram station within a few minutes walk. Views over the city are great and Petrin tower nearby. Monastery Hotel This rating is a reflection of how the property compares to the industry standard when it comes to price, facilities and services available. It's based on a self-evaluation by the property. Use this rating to help choose your stay! 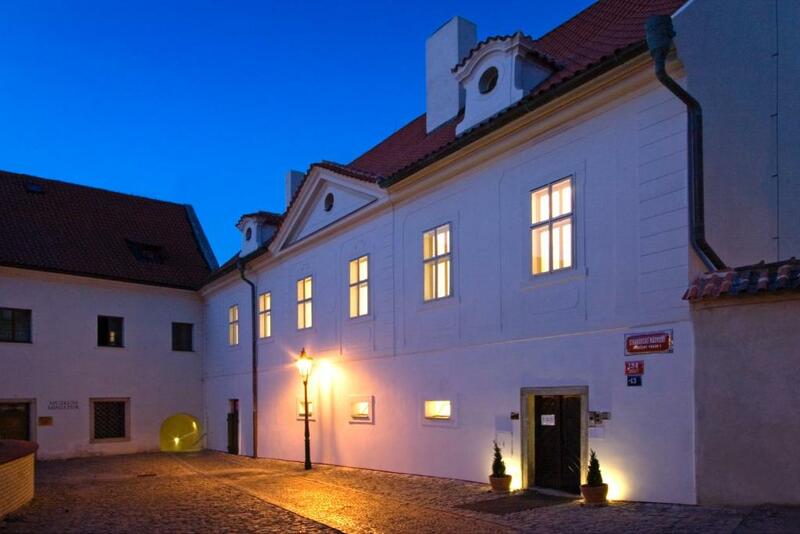 One of our top picks in Prague.The romantic Monastery Hotel in the peaceful grounds of the Strahov Monastery offers great views of Prague Castle, Lesser Town, the historic district and the Vltava river. 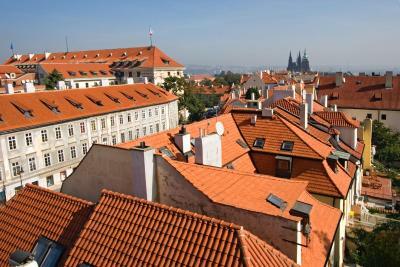 Prague Castle is just a few steps away and all the other historic sights of the Golden City are easily accessible by foot as well or by public transportation. 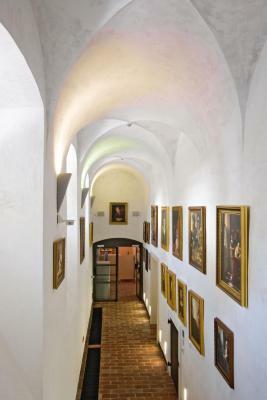 The modern interior design uniquely complements the ancient style of this building. 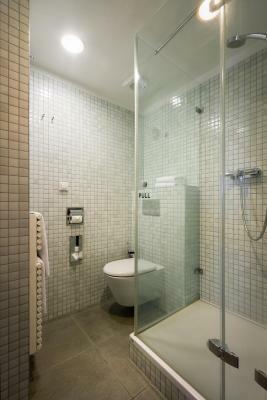 All rooms feature a flat-screen satellite TV, free high-speed internet and tea and coffee making facilities. An internet point and a wireless internet zone is available in the lobby free of charge. 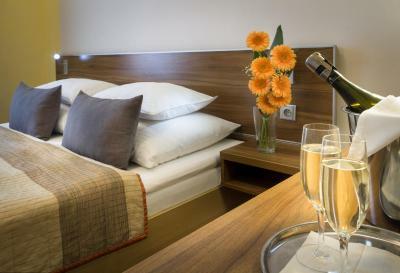 Drinks can be purchased at the 24-hour front desk, which can also arrange sightseeing tours and excursions. When would you like to stay at Monastery Hotel? 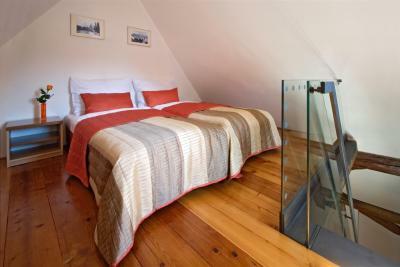 Elegant rooms with wooden floors and free coffee/tea making facilities. 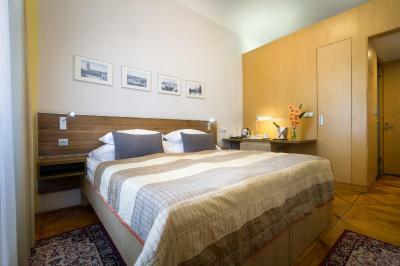 Elegant spacious rooms with wooden floors and free coffee/tea making facilities. 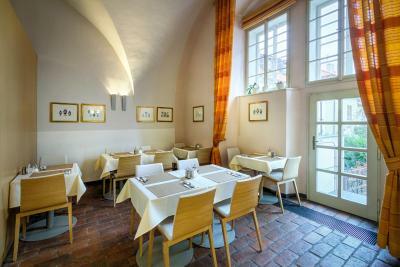 Romantic and cosy hotel Monastery with unique and unforgettable view of the Prague Castle, Lesser Town and the Old Town embroidered by Vltava river, is located directly in the city center in a peaceful garden of Strahov Monastery (national historic landmark, founded in 1142. 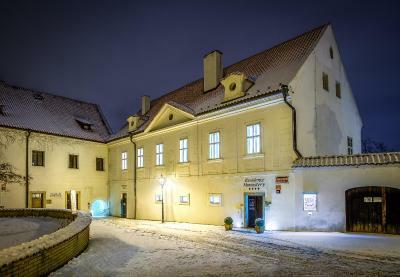 The foundation of the former building of a premonstratensian wash house (economic headquarters) consists of a ground-floor house from the beginning of the 17th century. House Rules Monastery Hotel takes special requests – add in the next step! Monastery Hotel accepts these cards and reserves the right to temporarily hold an amount prior to arrival. A deposit will be charged for the parking card. We loved the warm welcome and the location of the room. The personnel was extremely willing to fulfill all our wishes. We might come back again! Great hotel at a great location! Breakfast is good. I was having one of the top rooms with two levels, very interesting and out-of-the-ordinary. Super friendly staff. 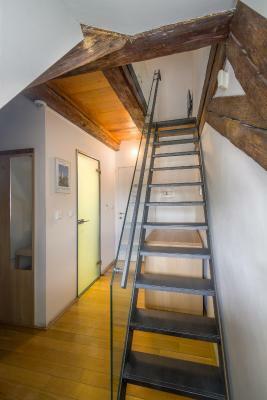 The steep stairs to the loft and limited headroom limits the comfort factor a bit, but at the same time it was quaint and if your not too tall and are fairly limber, no big deal. Everything except three things above. The beautiful view, Hot water Delicious food. There was no where to sit in reception/ lounge after a day out - we had to go into our room, which was slightly small. Staff were super friendly and helpful. 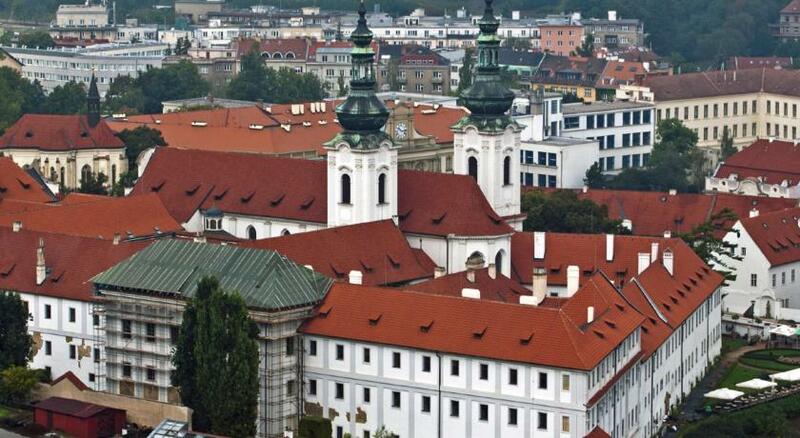 We only wish we could have stayed longer and enjoyed a private tour of the Strahov Library's interior, but these have to be booked months in advance. We appreciated being away from the noise and crowds across the river in the charming Monastery Hotel, an oasis of serenity. 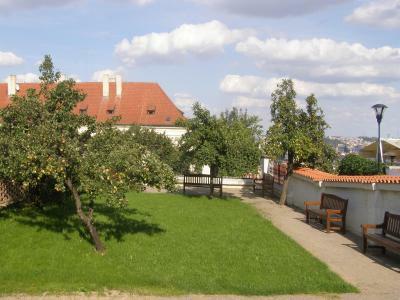 Our corner room had magnificent views of Prague, the beautiful monastery next door, and the hotel's garden, where breakfast is served in summer. 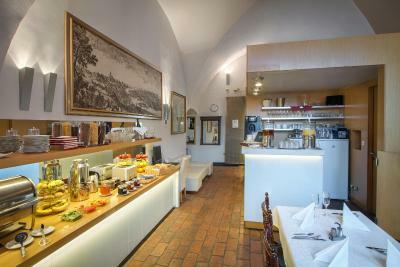 Within a few minutes walk are three restaurants, including one with a terrace that boasts one of the best views of Prague. Most of all, my husband and I appreciated the absolute professionalism of the staff. Even before we arrived, Adam offered thoughtful and well-researched suggestions for celebrating my husband's birthday. We were able to have flowers and champagne delivered to the room before our arrival at a reasonable cost. 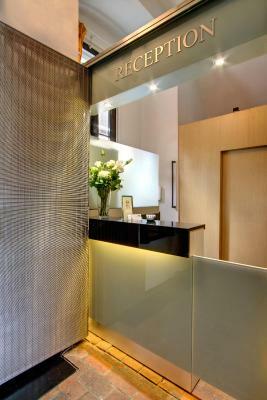 We were equally impressed with everyone working there, from cleaners to cooks and concierges. Stepan in particular deserves special thanks. He went above and beyond by helping us with our many requests and questions. That level of care and genuine hospitality are sadly becoming all too rare, but thank goodness they are alive and well at this hidden jewel on the hill. Beautiful and calm in a stunning setting with a beautiful view! Unique location and atmosphere. Helpful& friendly staff. Best in class! 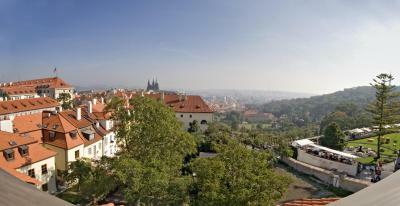 The monastery is in a great location, has beautiful rooms, and the views over Prague are wonderful. 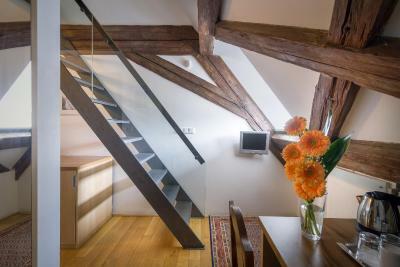 This was my second stay and I intend to stay there every time I travel to Prague.